Huge Life Size Licensed SCREAM Knife faux toy prop with metallic shiny SILVER Blade. Give friends a fright with this classic dreaded costume accessory adult toy novelty weapon like the one used by horror's most feared masked murderer with classic familiar ghost face mask. 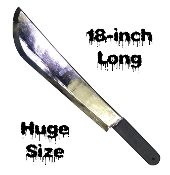 Nobody is safe when the Ghost Face Killer has this JUMBO size 22-inch Long hard molded plastic machete knife! Relive the terror you felt when you first saw SCREAM, with this officially licensed horror weapon. Add a ghost face mask and you have all you need to terrify your friends with a horror themed party celebrating this legendary slasher film series. This versatile prop can also be used with pirate costumes, zombie costumes, spooky character costumes, killer clown costumes and more. Twenty-two inch long deluxe hard plastic machete. This super cool plastic fake weapon accessory will accent any zombie, vampire werewolf hunter or horror movie killer character cosplay costume or stage murder scene. Plastic design is durable and easy to wipe clean. Approx 22-inch (55cm) long. Measures 21.75-inch Long x 4-inch Wide. *Warning: Not a child’s toy.